Italian niche line Carthusia has launched Prima del Teatro di San Carlo, a new fragrance made in collaboration with the Teatro di San Carlo opera house in Naples. The notes for the woody unisex fragrance include bergamot, mint, rose, precious woods, cedar, benzoin, amber and oud. 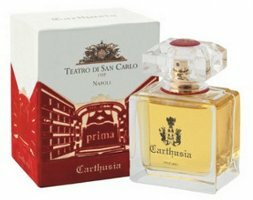 Carthusia Prima del Teatro di San Carlo is available now from Carthusia, in 50 ml Parfum, €90. It seems so obvious that the two forms of grand theatre should go together. I believe that Callas wore No.5 but what else would today’s star wear? I was thinking last week about the idea of a perfume opera. Someone should create one. There is nothing new under the sun!!! So was mine until a few years ago, but my mom loves it, so I learned some so that I could share her interest. Aren’t you a nice daughter! Comme des Garcons x Monocle Scent Two: Laurel would be perfect for Strauss’ Daphné. I always agonize about what to wear to opera, but as long as it is not something with nukular sillage, I think it’s all good. If Kauffman is Egoiste, what is Rene Pape? And Peter Mattei? Wouldn’t be great if the Met’s current Parsifal, which I will see in the HD broadcast, had a smellovision app..? Krizia released Teatro Alla Scala back in the mid-80’s. I remember not liking it (I love opera) and was disappointed. And there have been several names that riff on “canto”. I might try this as I generally like the Carthusia scents, although not enough to warrant a FB. … and let’s not forget the 2 perfumes from Luciano Pavarotti. Great calls! I love your gravatar btw. Ooh. I loved Teatro alla Scala and still have about half a bottle. It’s a loud one, though. This fat lady definitely sings! This is officially one of the greats. Luca Turin has nothing but the highest respect for it, he mentions it in The Guide twice as a reference oriental. I have a couple of bottles, including Estratto strength, though I don’t get to wear it too much – it needs a special occasion for sure..
Roberto Capucci released Opera III ( for women-in 1999) and Opera IV (for men- in 2000). Parlux created The Phantom of the Opera in 1989. Hilde Soliani released a while a go en entire line called Teatro Olfattivo di Parma, with some quite evocative names like “stecca” and “mangiami dopo teatro”. I remember trying out of that line “Vecchi Rossetti”, which is totally make-up bag (say, Dior Homme on steroids, in the best possible way) and “Bell’Antonio”, a wonderful tobacco/coffee scent. Worth digging in this line, it’s a very creative little niche house. Prima del Teatro di San Carlo is no display of coloratura bravura as might be suggested by the title. Far from the grandeur of an operatic theatre, Prima del Teatro emits the elegance and composure of precious woods and rose, and an underlying minty ‘coolness’. The underlying mint can be detected when uncapped and sniffed closely. This is not the typical overwhelming mint freshness. There is also a hint of bergamot and mandarin on closer sniff. The woody heart notes, then, infiltrate the cool, calm minty prelude that persists. The heart note features the crisp cedar wood on top of burnt-sugar benzoin. As it intensifies, there is a distinct waft of oud. The cooling mint can be detected amidst the dry woody molasses. The benzoin reminds me of L’Occitane’s Immortelle de Corse. However, instead of that freshness of the tea, there is a composed and elegant rose heart that rounds off the composition. This recitative lasts for a long time. Even when the woody notes depart, the combination of benzoin and rose lasts and lasts. I can imagine why it captures the enduring legacy of a long-standing opera house: behind those historic performances and triumphant debuts, there is always a dignified institution that has withstood the test of time. Constant. Unwavering. Absent those glorious years of composers in resident and even the legendary Maria Callas, the silent operatic venue stands. Imagine standing inside the vacant Teatro and takes a whiff of the air redolent of dry wood interiors and velvet. Prima del Teatro is exactly that. For those who find such experience incompatible, this may not be to your liking. Still, Primal del Teatro is certainly well-crafted. An understated elegance. Prima del Teatro di San Carlo has great longevity and moderate sillage. On a summer day of 30°C, it easily lasts 5 hours. My friend commented on how she occasionally smells it whenever the wind blew past her. Only the EDP is available for EUR92.